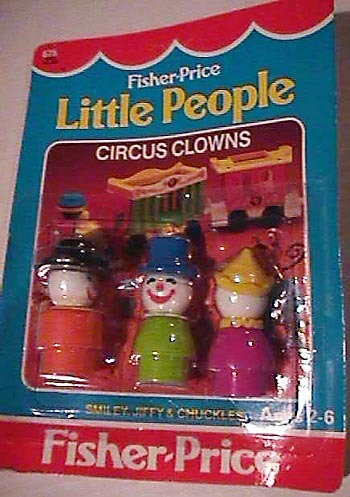 Description: This is a set of 3 Original Little People clown figures. The clowns can be played with alone, or used as added accessories to the #657 Crazy Clown Fire Brigade, or the #991 Circus Train. All of the clowns used in this set are exclusive to this set, with the exception of the dark red clown variation. DDPP - Purple body clown with a yellow cone hat, black + + eyes, and a big red nose. BKPP - Lime green clown with a blue top hat, large red smiling mouth, red round nose, and black curved eyes. CWPP - Orange body clown with a black felt hat, a blue non-triangular scarf, black + + eyes, and a big red nose. JSPP - Light red body clown with a yellow cone hat, black + + eyes, and a big red nose. *See Variations below. CXPP - Orange body clown with a black felt hat, a yellow non-triangular scarf, black + + eyes, and a big red nose. Variations: DUPP - The red clown with a yellow cone hat could also have a dark red body opposed to light red. This set was also sold in #680 Little People Assortment.